Ice cream and summer are almost inseparable—and that's never more true than on the Fourth of July. In what has become a summer tradition, the Sun Valley Center for the Arts will host an old-fashioned ice cream social after the Fourth of July parade in Hailey. As it has for the past several years, The Center will open up its Hailey location to all parade-goers, who can refresh themselves with free root beer floats after watching the parade in the hot sun. 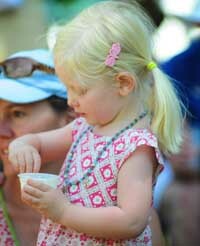 The Center will serve floats to all comers from 1 p.m. to 3 p.m. at its location on 314 South Second Ave. in Hailey. Vanilla ice cream will be donated by Atkinsons' Markets, and the floats will feature root beer by Bellevue-based BuckSnort Root Beer. The root beer is all-natural, organic and brewed locally, making it a perfect fit for a Sun Valley tradition. BuckSnort Root Beer owner Kainoa Lopez first started selling his brew after the Hailey Fourth of July parade in 2009, and his business has expanded exponentially since. BuckSnort is now served at eight valley locations as well as restaurants in Boise, Twin Falls and Fairfield. July 4 is also the birthday of local legend and leading Hailey citizen Roberta McKercher, whose former home now houses The Center's Hailey branch. Attendees of the social can take the opportunity to wander through the house, which was also the birthplace of poet Ezra Pound. Pound moved to Pennsylvania at the age of 18 months and eventually emigrated to England, but is credited with having a profound impact on the work of friend and Sun Valley legend Ernest Hemingway. The exhibit "Geared: An Open Exhibition" will be on display during the social. It features photos, prints, drawings and small sculptures of bicycles by local artists. Photographer Dev Khalsa's black-and-white portraits of locals with their favorite bikes are also on display. The exhibit will be on display from 2 p.m. to 6 p.m. on Wednesday through Friday until Sept. 23. A related exhibition in Ketchum, "Geared: The Culture of Bicycles," is on display through July 28. The Ketchum location is open from 9 a.m. to 5 p.m. Monday through Friday and from 11 a.m. to 5 p.m. on Saturdays in July and August. The Center can be found at 191 Fifth St. East, at the corner of Washington Avenue and Fifth Street.